Nowadays, when we are surrounded by modern conveniences and up to the minute technology at every turn, it can be oddly difficult to remember our basic needs. We often get so caught up in having the newest and highest end gear (plus cute adventuring outfits) that we often forget to address the essential basics. After all, even the trendiest pair of boots or the sleekest tent can’t provide clean, life sustaining water, and—short of bringing along a pack mule to tote gallons of the store bought, pre purified stuff—the most effective way to ensure you will always have clean water is by packing the best water purification tablets. Ah, come on. Do you really need water purification tablets when you’re adventuring out in the wilderness? Really? Even when you’re dipping your water bottle in a crystal clear stream, miles away from civilization? The short answer is YES. The long answer is oh my goodness you’d better believe it don’t skip water purification tablets on your life, YES. Even though the world still contains vast swaths of wilderness, the water that flows through those wilds isn’t untouched from pollutants from human activity such as mining, sanitation systems, or industrial run off. Pathogens thrive in untreated water, and though you might feel invincible while on the trail, the truth is that you are still plenty vulnerable to the damage these microorganisms can wreak upon your body. Water straight from the steam can contain pathogenic agents like harmful protozoa, bacteria, viruses, and the larvae of such unsavory critters like roundworms and liver flukes. Common pathogens in non purified water include Giardia lamblia and Cryptosporidium, which will both give you a pretty horrendous case of diarrhea, which out on the trail can dangerously dehydrate and weaken you. With all of these potential dangers present, it just makes good sense to purify any water you take from a natural source, and nothing makes this easier or faster than water purification tablets. These small and lightweight tablets are a must have for anyone’s pack; most tablets will kill all the top pathogens in less than an hour, turning lake water to drinking water no matter your location. We’ll take a look at some of the top rated water purification tablets on the market today, giving you a solid overview of features to help you determine which will work best for your needs. Water is essential to our survival, so choosing the right water purification tablet (and understanding what it does and doesn’t do) is a serious undertaking. Here are a few key points to keep in mind when you’re shopping for the best way to clean your drinking water on the trail. Most tablets on the market promise to kill “bacteria and viruses,” but…that’s a pretty large—not to mention vague—blanket statement. Even though all water purification tablets will likely get the job done to provide you with perfectly potable water, you might find it’s worth doing a little digging to determine exactly what creepy crawlies any particular tablet will knock clean out of your next drink. As we mentioned before, some of the biggest, baddest pathogens to look for by name are Giardia lamblia and Cryptosporidium, and companies in the know will often specifically cite them in particular to let you know their product will effectively remove these from your drinking water. If you take things one step further and research the quality of the water in the areas you’ll be visiting, you might be able to determine how important it is that your tablet overtly addresses these pathogens. In this age of instant gratification, it might seem silly to have to wait for clean water. Like, can’t you just turn on the tap? Well, not on the trail, where good things come to those who wait. In shopping around for water purification tablets, you’ll find that they all have a varying range of wait times from when you drop the tablet in the water to when you can safely take a swig. Many tablets these days can turn questionable water into safe water within an hour, but some require more time. It all depends on your style; if you’ll be planning ahead for your needs and will be dropping tablets in your water well in advance, a long wit time won’t be an issue. But if you’re the kind of person who doesn’t think about clean water until you absolutely need it right now, you might want to pick a tab that works a bit more quickly. Water purification tablets are pretty magical little things, and they contain a lot of important ingredients that don’t stay effective forever. You’ll want to stay on top of those expiration dates well in advance of setting out on the trail so you aren’t in for a rude surprise (and dirty water) when you’re looking to quench your thirst. Managing the shelf life of your water purification tablets basically comes down to the frequency of your outings. If you’re out camping and hiking and relying on natural sources of water on the regular, then you’ll want to splurge on the bigger package of tablets, otherwise you should only buy on a per trip basis to make sure you’ve always got tablets that will do the trick. When you’re thirsty and dying for a drink out in the middle of the wilderness, you’d probably pay any amount for just one little sip of crystal clear water. But hopefully it won’t ever come to that, and when you’re shopping for purification tablets, there’s no shame in keeping your budget in mind. Price goes hand in hand with your frequency of use: if you’re going to be using lots of tablets on regular outings, it makes good financial sense to buy your tablets in bulk. Otherwise, you should budget to buy on an as needed or per trip basis. Even though this will be more expensive than buying in bulk, you’ll always be sure to have effective tablets, and really, when it comes to clean drinking water, you should be willing to spend a couple extra coins for the luxury. If you simply don’t have the time to do all the legwork of research on water purification tablets by yourself, user reviews can be your very best friend. Your fellow adventurers have many words of wisdom to share about what works (and has worked) best for them, and you might even stumble across a review written by someone who explored the very same areas (and water supplies) you plan to take on yourself. Of course, you should always take all online reviews with a grain of salt and prepare to do at least a little bit of your own research to ensure that the product in question is as good as all the reviews claim it to be. User reviews can be a fantastic benchmark, but you should always scratch a bit more beneath the surface before you make a purchase. Now, taking all our pointers into account, let’s take a look at some of the best water purification tablets on the market today. 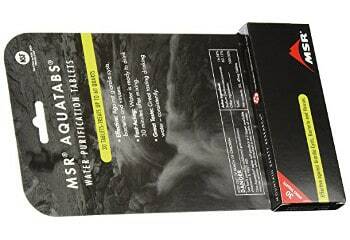 MSR Aquatabs Water Purification Tablets are a popular choice amongst backpackers and disaster preppers, thanks to their reliable and efficient purification. You can use these tabs on their own or in addition to a microfilter. These tabs are effective against viruses, bacteria, protozoa, and Giardia cysts, so you can drink with confidence knowing that your water is fully potable. The small foil wrapping these tabs are packaged in make them a lightweight and easily transportable addition to any pack. These purification tablets have a years long shelf life, with most consumers reporting that the tablets they receive are good for a minimum of about three years. Some users report a slight chlorine aftertaste, but many didn’t notice any taste at all. When you look at the cost of these tablets per unit, they can be a little more expensive than some others, but you may determine that the cost is worth their solid reputation. Related: The manufacturers of the MSR Aquatabs Water Purification Tablets specifically recommend the use of the Sawyer Products Mini Water Filtration System in conjunction with their tablets. This lightweight, high performance filter weighs just two ounces and can easily connect to a drinking pouch, disposable water bottles, hydration packs, or you can drink right from the water source with the included straw. This filter removes 99.99999% of all bacteria, including salmonella, cholera, and E. coli. It also filters away 99.9999% of all protozoa including Giardia and Cryptosporidium. This filter is small enough to fit in the palm of your hand, so it wont’ take up too much room in your pack. 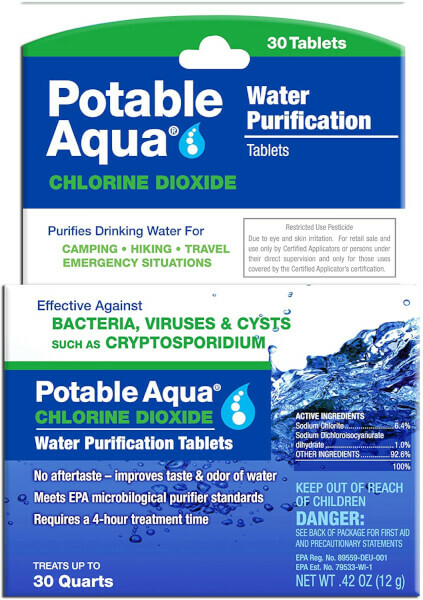 Potable Aqua Chlorine Dioxide Tablets are a convenient, easy to use water purification system that eliminates an entire laundry list of pathogens from your water. The downside to this is that these tablets take up to four hours to work, so they’re not exactly your go to if you need a drink immediately. But if you are planning ahead at the campground and dissolve tablets ahead of when you’ll need to use the water, these reliable tablets might be for you. Users report that this tablet is extremely effective, even in water “of every color,” effectively killing all the harmful pathogens that cause humans trouble. The fact that they take so long to work is a definite downer, but many trekkers swear by these tabs and confirm that these tablets are well worth the wait for their resultant water quality and the peace of mind they bring. Related: The LifeStraw Personal Water Filter quickly and easily removes 99.99999% of waterborne bacteria and surpasses EPA water filter standards. This filter will also remove a minimum of 99.9% of waterborne protozoan parasites without any chemicals. The filter comes stored in a sealed bag to keep it clean before use. It weighs only 2 ounces to make it a lightweight, barely there addition to your pack. LifeStraw has actually been used in relief efforts for major worldwide disasters, providing clean water immediately for those in desperate need. This filter requires no batteries and utilizes a hollow fiber membrane filter. Coghlan’s 7620 Drinking Water Tablets will get the job done when you need clean drinking water in a hurry on the trail. Users report that these effective tablets will even clear cloudy water, and in fact they are proven to kill most harmful microorganisms, including Giardia. It should be noted, however, that they do not protect against Cryptosporidium. The manufacturer recommends that these tablets only be used on a short term basis for emergency purification purposes, so if you are going to be trekking for an extended period of time, you might want to look into a high quality water purification filter to use in lieu of tablets. The pre measured tablets are guaranteed to provide the exact right amount of purification strength per the recommended volume of water, and users report that these tablets deliver exactly what they promise. These tablets are even good to have on hand for emergency home use. Related: The Polar Pure Iodine Water Filter Purifier is a beast of a purification system that can sterilize 2,000 quarts of water. This cost effective product sterilizes water at an astounding rate of one cent per quart, and can kill pathogens that filters may miss. An unsealed bottle has an indefinite shelf life, and the compact bottle weighs just 5 ounces. This product promises to eliminate pathogens that have become immune to other tablets, giving you optimal peace of mind no matter your water source. This water filter is EPA certified and exceeds the minimum threshold for sterilization. One of the most expensive offerings we will cover, the AquaMira Military Water Purifier Tablets are an effective part of a water purification system, although their price and the length of treatment time required might be enough to turn a new user away. These tablets have a dedicated group of consumers who swear by them, however, so this product may be one that requires some serious sifting through user reviews to determine whether they are worth the investment for your individual needs. These tablets can be used in conjunction with the AquaMira Frontier Emergency Filter System or Aquamira Water Bottle and Filter to create a fully comprehensive and reliable water purification system for every wilderness outing you embark upon. These tablets have also been used on already treated water to improve the taste and quality, so they are handy to have around the house or while you are traveling. Related: The 4 Quart Per Day Non Electric Prime Water Purifier is a sturdy, non electric water purification system that is as effective as it is simple. It is constructed of 100% stainless steel and never requires any filters, and comes with a clear instructional video to help you get the hang of using it smoothly and efficiently. This filter allows you to distill and purify water from any source, even pools, swamps, puddles of stagnant rainwater, tap water, sea water, pond water, and river water. This system yields up to four quarts (4.2 liters) of purified water per batch. Aquatabs Water Purification Tablets have been used by high level organizations worldwide to purify untreated and treated water alike, to ensure the safety of drinking water for millions of people. 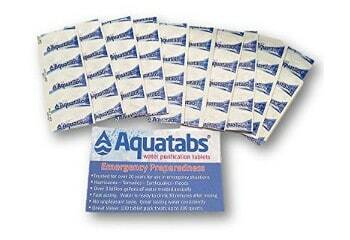 These tabs only take 30 minutes to work, and can also be used for surface disinfection if need be. With a shelf life of three years, these water purification tablets are extremely cost effective, and will be able to accompany you on many adventures before you have to order replacements. Aquatabs tablets are proven to lead to a 6 log reduction in bacteria and a 4 log reduction in viruses, as well as a 3 log reduction in Giardia, so you can drink with peace of mind. These lightweight tablets will go virtually unnoticed in your pack, but you’ll definitely notice the important role they will play in keeping you and your friends and family in clean, drinkable water for the during of your many outdoor adventures. Related: The MoKo Portable Water Filter is a lightweight, portable alternative to the chemical purification found in tabs and other products. This filter turns rainwater, lake water, and even river water in to drinkable water with a super fast flow rate. Meeting the highest sterilization standards of the World Health Organization, this filter has an advanced activated coconut shell carbon filter that enables it to eliminate 99.9999% of bacteria as well as heavy metal ions and organic contaminants.The replaceable carbon filter can be re used time and time again for up to 3,000 liters (660 gallons) of water before it needs replacing. The Katadyn Micropur MP1 Purification Tablets are a chlorine dioxide tablet that quickly and effectively turns any water into drinkable water in a quick 30 minutes. These high performing tablets kill both Giardia and Cryptosporidium, with the exception that you must wait four hours for the tablet to fully rid the water of Cryptosporidium. Users report that these tablets consistently yield water that tastes fresh with no noticeable aftertaste, no matter how dirty it was before the tablet was used. Each tablet is individually wrapper and sealed, making it easy to take just he right amount on each outing and ensuring that the tablets will stay clean, dry, and protected to prevent any unwanted surprised on the trail. Some users report they have even used this tablet on travel to foreign countries and on airplanes, anywhere the water quality might be questionable for those whose bodies aren’t used to that particular exposure. Related: MSR Sweet Water Purifier Solution can treat up to 80 gallons of tainted water with just one tiny 2 ounce bottle when used in conjunction with the Sweet Water Purifier System. Some users report that this solution does leave an undesirable taste to the water, and some complain that the active ingredient (3.5% sodium hypochlorite) is nothing more than common household bleach, making this an extremely expensive little bottle. But most users recommend this product for reliable, clean water every time, especially when traveling to foreign countries, but also when out on the trail and in need of a quick purifying system of found water sources. Water is certainly one of the building blocks of life, and one of the essentials we all need to stay healthy and functional, on the trail or anywhere we go. While we often get caught up in the fancier elements of our gear, water purification is not to be overlooked when planning to spend an extended amount of time out in the wilderness. Water purification tablets are a wonderful way to ensure clean, healthy water every time. Do you have any experience wth water purification tablets? Do you have a favorite brand that works every time? Share you experiences with us in the comments!